Depression is a debilitating condition that affects millions of people worldwide. Symptoms of depression can interfere with an individual’s daily life, and include mood swings, fatigue, disturbances in sleeping and eating habits, physical pain and a sense of hopelessness. Due to the intensity of these symptoms, some people turn to pharmacology for relief. However, many prescription medications used to treat depression are associated with numerous adverse side effects and reactions, which can include a worsening of depression and its symptoms, insomnia, sexual dysfunction, nausea, dizziness and digestive problems. Because of these side effects, many individuals, especially those suffering from mild or moderate depression, opt for alternative treatment in the form of herbs. St. John’s Wort, also known as chase-devil and Tipton’s weed, has been used to treat depression for centuries. This herb is recommended for mild or moderate depression, as it has very little effect on major depressive disorder. Perhaps the most well-known natural remedy for depression, St. John’s wort is widely available over-the-counter in the United States, and is prescribed for depression in Europe. St. John’s wort is a natural reuptake inhibitor, which means it treats depression by blocking the absorption of serotonin and other chemicals in the brain, which lends to increased mood and feelings of happiness. St. John’s wort may provide similar effects to those of prescription reuptake inhibitors include Cymbalta, Effexor and Pristiq. Side effects of St. John’s wort include the following: diarrhea, dizziness, nausea, insomnia, dry mouth, fatigue and sensitivity to sunlight. In addition, studies have shown that St. John’s wort may have adverse or dangerous reactions to certain drugs, including birth control pills, medications used to treat HIV, cancer medications, anticoagulants and others. 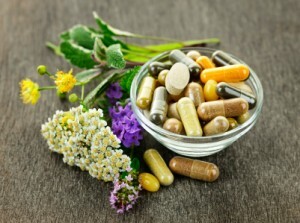 So, do not take St. John’s wort if you are taking any of these medications and ask your doctor about any possible adverse reaction with this herb if you are taking any other prescription medication. Second to St. John’s wort, valerian root is the second most common natural remedy for depression. Grown primarily in Asia and Europe, valerian root has been used for hundreds of years in the treatment of certain symptoms of depression, including insomnia, anxiety and irritability. Valerian root is a natural relaxant, and helps calm the mind and body by relieving stress and anxiety, and is readily available in drug or grocery stores. Valerian root is commonly sold in pill form, but is also available in dried form for the purpose of making tea. As it is natural and non habit-forming, valerian root is considered safe for most people. Common side effects include drowsiness, dizziness and upset stomach. Because of its relaxing effects, valerian root should not be taken before driving or operating heavy machinery. 5-HTP is short for 5-hydroxytryptophan, which is a chemical that occurs naturally in the human body. 5-HTP treats depression by increasing serotonin levels in the brain, much like certain prescription medications such as Prozac. 5-HTP is sold as a supplement in the United States, and can be found wherever vitamins are sold. Common side effects of 5-HTP are nausea, dizziness and diarrhea. Less common are more serious reactions, such as heart palpitations and high blood pressure. It should be noted that taking 5-HTP with other drugs that increase serotonin can have extremely dangerous effects. Too much serotonin can lead to serotonin syndrome, which can cause extremely high blood pressure, rapid heartbeat, hyperthermia, dizziness, confusion and hyperreflexia. Talk to your doctor before taking 5-HTP on your own. Although not a plant or herb, SAMe is a naturally occurring substance that is found in the human body, with the highest concentrations found in the liver and adrenal glands. SAMe treats depression by increasing levels of serotonin and dopamine in the brain; with increased serotonin and dopamine, mood is enhanced and depression is lifted. SAMe is sold as a supplement in pill form, and can be purchased at most drug stores or supermarkets. SAMe usage has been linked with mania and hypomania and therefore shouldn’t be taken by individuals with bipolar disorder. Common side effects include upset stomach, skin rash, anxiety, hyperactivity, insomnia and headache. As the effects of SAMe on pregnancy are unknown, it should not be taken by women who are pregnant or breastfeeding. Lavender is a purple-flowered plant that has many healing and relaxing properties. Unlike other herbs and plants used for depression, lavender is primarily used topically or as aromatherapy rather than ingested; however, lavender can be ingested in its dried form as a tea. Lavender oil can be applied directly to the skin or used to scent rooms, pillows, sheets, etc. The scent of lavender has been shown to have a calming effect, and can help depression in the following ways: by reducing stress and anxiety, relieving headaches and other aches and pains associated with depression, and improving quality of sleep. Lavender shouldn’t be used by children or adolescents, and should never be orally ingested in oil form. Likewise, lavender has the potential to induce extreme drowsiness when combined with other sleeping and anti-anxiety medications. Kava kava is an herb indigenous to Polynesia, and is often used to treat the symptoms of depression and anxiety. This remedy is often consumed by crushing the root of the kava plant and mixing it with water, but is available in capsule and liquid form as well. of these effects, kava kava is also used to improve quality of sleep for individuals suffering from anxiety and depression. As with other medications and natural remedies, side effects of kava kava depend on the dosage taken. If taken in large quantities, kava kava can cause severe liver and kidney damage, seizures and muscle problems. More common side effects include headache and upset stomach. In addition, kava kava should not be taken by women who are pregnant or breastfeeding. Although the effectiveness of herbs in the treatment of depression is often debated, studies have shown that many individuals with mild to moderate depression do find relief with herbal remedies. When it comes to severe depression, herbs may have little or no impact on symptoms, and can sometimes produce negative effects. For major depression, seeking medical treatment is essential. Herbs should never be taken with prescription antidepressants, as doing so can lead to severe, and often dangerous, side effects. When switching from antidepressants to herbs, one should wait at least two weeks to ensure all traces of prescription medication have left the system. Vitamin D for Depression – Does it Work?